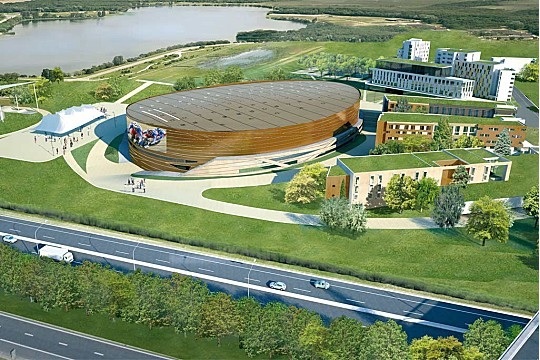 Enthusiasts of the Paris-Brest-Paris may like to note that the new velodrome at Saint-Quentin-en-Yvelines (on the outskirts of Paris, near Versailles) is now open and ready to host its first competition. The velodrome is close to the start/finish that the Paris-Brest-Paris has used for the past few occasions. Perhaps in the future the start will be from the Velodrome? Who knows…. but it would be handy for those who fancy a bit of track racing after a 1200km ride!!! The velodrome will accommodate 5,000 spectators with 4,800 seats around the track and room for a further 200 seats in the central area at the heart of the track. The dimensions of the track are 250 meters long and 8 meters wide with a corner radius of 23 meters. This entry was posted in Audax, PBP, Track. Bookmark the permalink. Finish P-B-P with a lap of the track, excellent! !